This entry was posted in iPhoneography, Nature, Photo Challenge, Photography and tagged Florida, iPhone 5, iPhoneography, Nature, Photography, Sunday Trees. Great tee. I like how the branches are connected. Looks like it has buds too. Isn’t spring amazing. My ash does a similar type budding when Spring is approaching! Thank you for sharing! Do you think this is an ash tree? I’m afraid I just don’t know my plants or trees! Looks like a wonderful tree to climb and watch the world pass! I hadn’t thought of that but it would be fun to be up there watching all the downtown shoppers pass by! LOL! 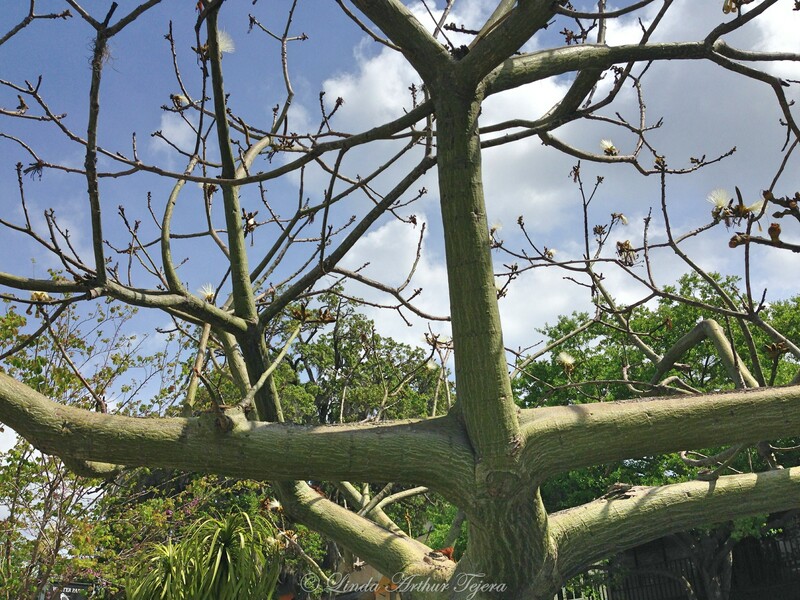 Hard to tell since the tree seems to be budding, with no leaf, or full flowers, it looks like a tropical tree, like a Ceiba, or a Fire tree? I should look up those trees. I just never learned the names of plants or trees! like in the comment above – she noted the leaves would have helped her. Some trees have a distinctive overall appearance and shape that can be used to identify them, especially from a distance. Compare a silver birch with its narrow shape and light and airy crown to the broadly spreading crown of an oak. Love the strong trunk to the right, Linda – this feels like I could hang art paintings around this tree – or it just seems ready to be used by a human. Say, now, artwork would be an interesting display hanging from those limbs! Wonder if they do anything like that on different holidays. You’d appreciate that it’s downtown Winter Park! oh now you are getting super creative Linda. I could see art being propped on them too – maybe even a mobile. I see a giant stick man jumping down on me with outstretched arms. 🙂 That’s just me I suppose.